A product of JC Product Workshop：first tech organizer developed by tech users. Our Tech organizer bag is finally here. A big shout out to all our members from the Product Workshop who collaborated to develop this bag. Your amazing ideas help created this bag. Thank you all. Please note this first edition has a few minor differences from the final edition, please refer to the product photos for accurate display. Use this one bag to organize and pack all your electronic devices! This organizer bag is designed by frequent travelers and Tech experts, they have added features and improved details based on their own experience. Why Is This Organizer Great? After you place a charging station/hub with the velcros, you will never need to remove it from the bag again. You can connect the power outlet and all charging cables while leaving everything in the bag, making your charging process 10 times easier. This is extremely handy especially when you are on a trip, staying in a hotel. Before checking out the room, you don't need to pack your electronics, just pull the cables in and zip your bag and you can leave right away. Double zipper for leaving a gap in any direction: when you want to pull out a charging cable from your power bank without having the whole bag wide open. Massive storage space: outer front pocket, inner front pocket, mesh pockets with zipper, elastic velcro straps, etc. 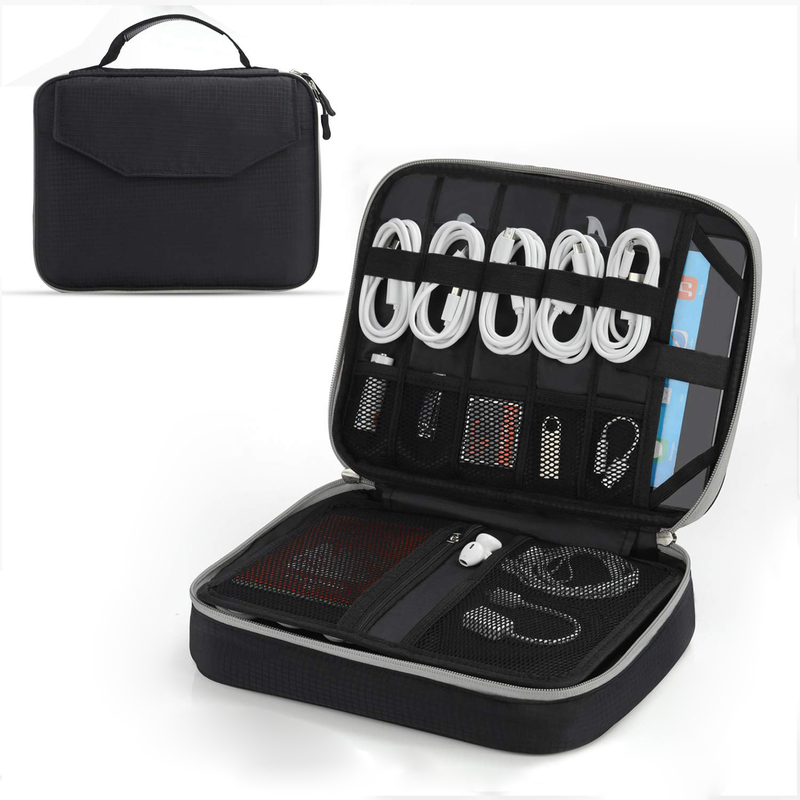 The Jelly Comb Electronic Accessories Travel Cable Organizer Bag is an excellent selection for time management, content security, and ease of access for routinely used electronic devices. The electronic components are at your fingertips with this accessories bag. 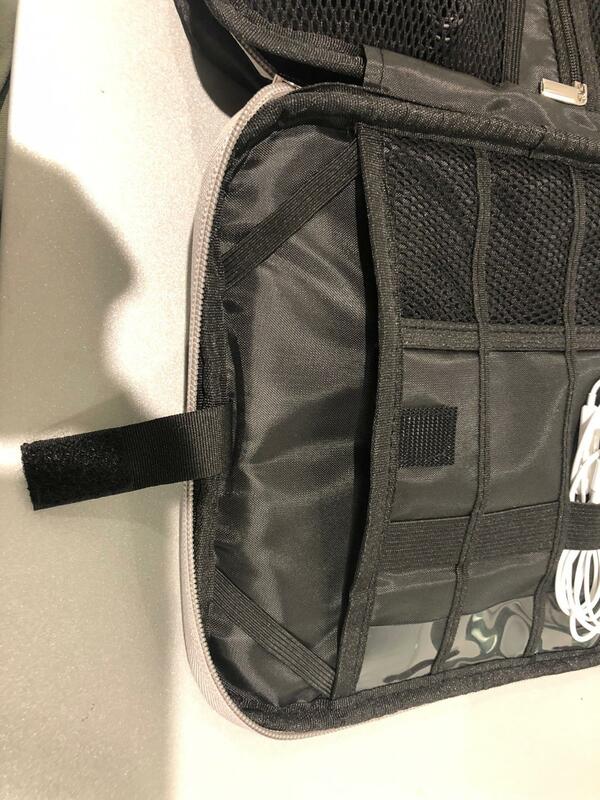 The bag contains separate dividers with a variety of sizes of Velcro straps, compartments with zippers, without zippers, and a panel the perfect size for a tablet. Do not let the compact design mislead you; space is abundant for arranging a variety of electronic devices and multipurpose connectors for your daily professional and personal use. Additionally, the Jelly Comb Bag is protective: a water-resistant nylon exterior protects tablets, cell phones, multiple device converters, AC adaptors and much more. When placed inside a briefcase or backpack, the security and protection of the contents are much better. Varying weather conditions can permanently damage electronics. Defense against the changing environment is an essential precaution. Rain, nor snow will damage sensitive electronic equipment sealed safely inside the bag. I (we) live where it begins snowing late in the fall and continues through early spring. Mixed in with the snow (far too often) are drizzle, sleet, and freezing rain. I need the contents of this bag well protected from all those adverse conditions. 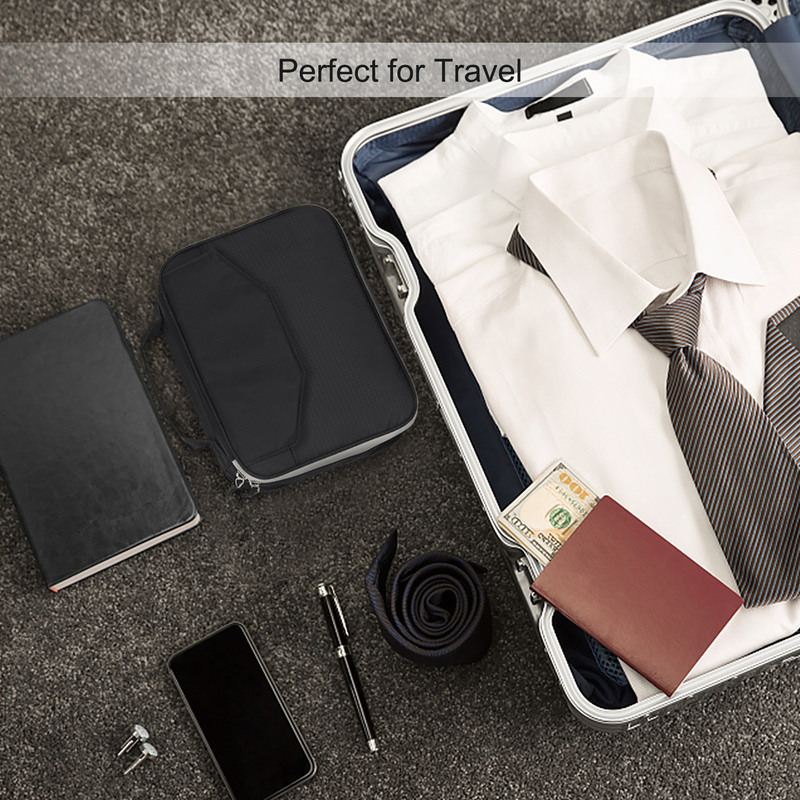 The Travel Organizer fulfills all those requirements and many more. The combination of humidity and dew point during the summer months can be so dense with moisture that exposed electronics are at risk of permanent damage. Those harsh conditions will not affect the contents of the bag. The waterproof exterior keeps the moisture out and interior of the carrying case dry. Designed into the carrying case is the bonus security feature of a shock absorbing THICKEN cotton insulating material. The impact of a drop is diminished with the absorbing shockproof sponge. 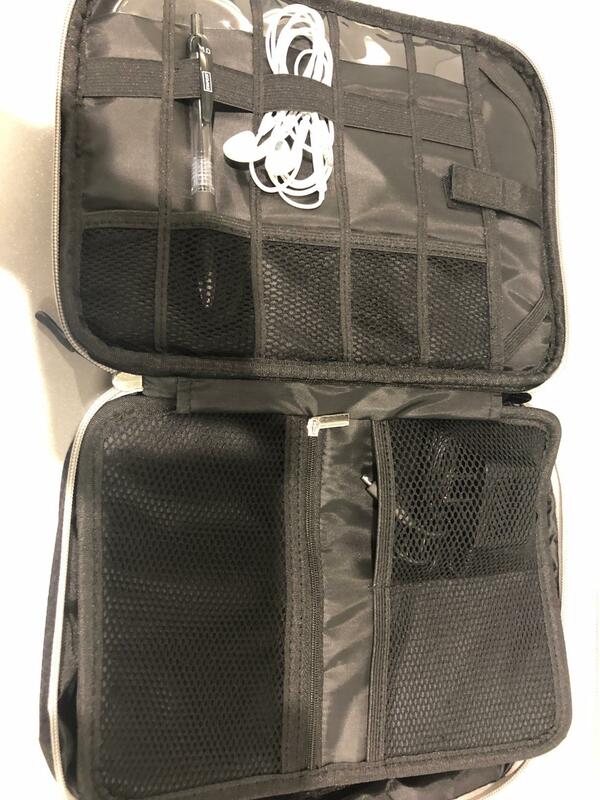 Safeguarding the contents within the case from accidental drops can save on replacement costs of tablets, cell phones, and the other valuable electronics contained inside the Travel Cable Organizer “Protector” Bag. Generous space within the case is divided for similar groupings of standard accessories. This type of organization eliminates the irritation of searching for what you need while finding what you don’t need. Say goodbye to those frustrating days of untangling power cables, charging cords and earbuds. Before purchasing this bag, I carried the same contents loose in one pocket of my backpack. It was a stressful way to start the day – trying to find what I needed when I needed it quickly. Flash drives would slide through the tangled web of power cords, accessory cables, and earbud connectors to the bottom of the pocket. I would have to untangle and sift through everything at the top to locate what I needed from the bottom. Never again will I search for flash drives or any other device or cord contained within the bag. The purchase of this carrying case has eliminated all that unnecessary frustration. I made the decision to purchase this convenient organizer three months ago. I use it every day going to the office and at home in the evenings. It is the first thing that I take out of my backpack, unzip and place on my desk. 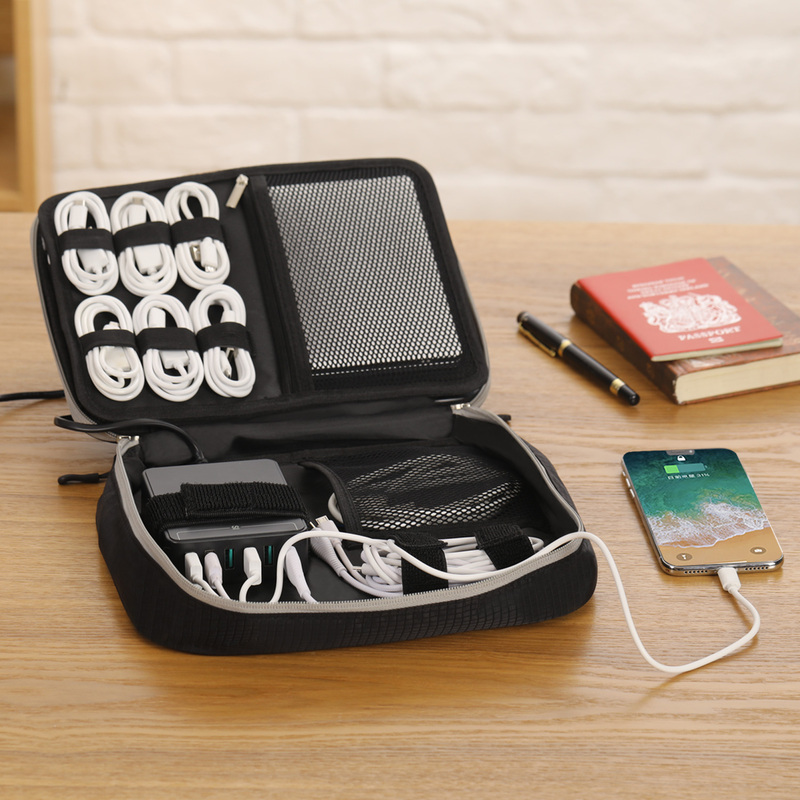 The Jelly Comb Electronic Accessories Travel Cable Organizer Bag is everything I have shared with you in this review, and so much more. Buy one and see for yourself how effective it is to carry with you; whether that be in your briefcase or backpack. It will save you time and frustration every day. I like how the velcro straps keep things in order, I fit a multi-port charger in there perfect. This bag has so many pockets and straps for cords, and it's very convenient for holding all of my electronics and chargers in one place. There's a sleeve for tablets, but I use it to hold a small notepad instead. I've also used it for a last minute makeup bag, and it's pretty good for that too! This is fantastic for traveling! Helps me stay organized while on the go. Well made product. Does what is advertised and organized a full drawer of small cords. This little bag is perfect. My family travels a lot so it is great for storing all of our chargers, i pods, daughters iPad, and lots of other things. There is plenty of room and the case itself is very nicely made. This bag is nice and roomy, and it has space for a bunch of computer peripherals, adapters and cables. It has pockets and straps to keep your items organized and ready for use. It also has room for a small tablet, like kindle or an ipad mini. It has a nice quality feel and seems durable. Happy with the purchase. I have had a few of these types of items over the years, but this one from Jelly Comb is one of the best! With multiple storage places for cables, tablets, battery banks, and more, this bag is all i need to travel with! The bag is great for holding small accessories in I purchased it to use with my nintendo switch and it is a lot better than the smaller sized cases with way more room to hold the games and extra controllers. I am totally surprised by the amount and varied storage options built into the little bag! I only wish i had this for my last trip i took! Gone are the days of having to pack cables into a bunch of zip lock bags, which rip or get lost. No more tangled messes! I can fit my gen one iPad Pro, with all of its accessories in it. You could probably even fit some smaller netbooks with all the cords and still have room for all your other cables and accessories. The material is light weight and durable, and there is enough padding to protect your items. 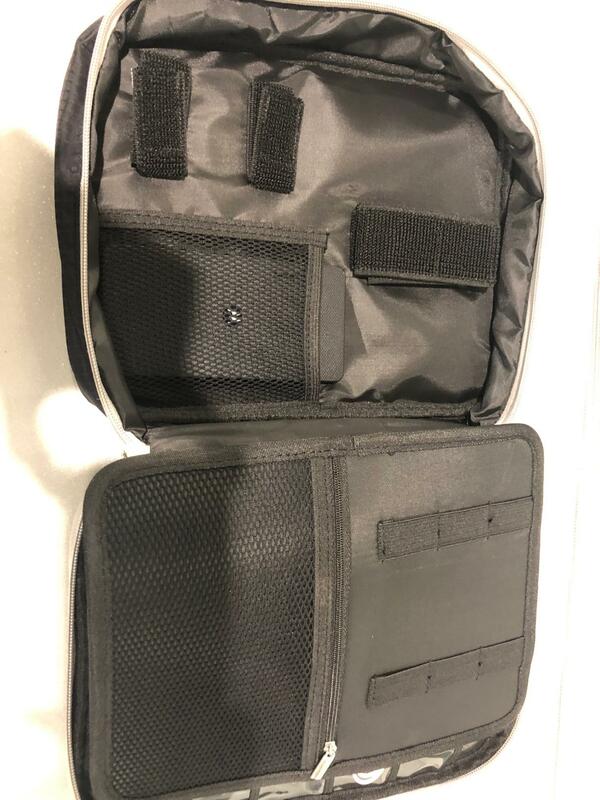 This is an excellent organizer to put ll your stuff in and still be able to put it into a carry on bag, like a backpack or a large purse, on a plane. I am a retired computer engineer. I usually carry around cables, small parts and pieces, USB devices, a few tools, and a pad of some sort. This is an excellent carry all so that everything has a place and does not get lost or broken. It is small enough to handle easily and large enough for most anything that needs to go with me. The maximum size of the pad is about 9.5 inches. For other carry along things, it is spacious. When you open it, everything is visible, secured and easy to find. The case itself is good protection for sensitive devices such as a drive, memory modules or USB sticks. The price is reasonable and the comfort of having things safely enclosed is pleasing. I feel that this is well worth the money and though it is NOT limited to only the things I have mentioned, I can honestly say it is excellent for these choices. I enjoyed this product. I had a lot of electical wires laying around and so this bag was a great storage item. I originally bought this cause I bought a keyboard and mouse from the same company and I needed a case to put the keyboard and mouse in. Long story short, I didn't do my research and the keyboard definitely doesn't fit in here. I tend to cram everything right into my coat pockets but that's a problem since my coat pockets don't have zippers and anything can fall out. I've lost several cables to my darn loose pockets. Also, whenever I need to find something in my coat pockets, I'll usually spend a good minute or two trying to dig out what I need. This thing is an absolute lifesaver. I've been able to stuff all of my daily electronics into this thing with no issues whatsoever. There's different tabs, dividers, slots, and pockets for me to organize all my stuff. The product's pictures don't do it any justice, you have to see it for yourself. It's like one of those tents in the Harry Potter movies where it looks small on the inside, but it's a mansion on the inside. This is the same scenario! It looks tiny in person but there's just so much space to fit things in. There's a lot of small quirks that I love about this. The rubber attached to the grip for easy carrier, the tabs on the zippers for easier pulling, the tons of Velcro strips inside and outside the bag. It's the small things that make this case so practical. I got this for my grandson for his birthday. I love how he is gonna be able to keep all his different electronics in the same case along with their cords! That’s what I needed for my cords, chargers and other stuff. Good bag to organize and avoid mess. Quality seems good. I got this in order to hold a bunch of extra cords I need when I'm bringing certain things with me to someone's house. It holds everything nicely so you can see and grab what you need right away. The material feels sturdy and plenty of slots to hold different types of cords or items. This makes carrying those extra cords so much easier. First off, I am very happy that there are a lot of photos for this product because it provides a little guidance on what each compartment can be use for. I really like the design on this case. I like that it sort of feels like a case for a little netbook and that the handle is sewn into the case. I had purchased a similar case (from a different brand) and the handle was clipped onto the case in a corner which made it awkward to carry especially when my tablet or Kindle was inside since it would be heavier. I don't have that issue with this bag! I seriously love my electronics bag! At my house we have lots of extra charger cords, portable chargers, etc laying around, and now I have a place to store them all neatly. Lots of compartments and spots to put all sizes of my electronics. Love it! No complaints, and I would recommend this product to others.